Long time ago I’ve seen someone come up with the idea of painting a collar with reflective paint directly on a LED dome. Both LEDs that you see are actually the same model. But they are depicted at different angles, one is straight and the other is rotated by 45°. Let’s call the green angle α and the red one β.
Let’s call the orange angle γ and the violet one δ.
Let’s call the lens collection angle ε. When a collar is much larger than a die these are close to each other. When it’s as small as here….that’s not the case. We need to decice on how high to paint the collar. One option would be to have no light escaping the LED at off angles (and hitting flashlight head). Depending on your lens (and its ε) this may require painting the entire dome (hmm…not a great option) or a large part of it. Painting large part of it means that a lot of light emitted at perfectly good angle (even straight up) hits the collar and is reflected back. That means bouncing around a lot of light. And each bounce is a risk of the photon being absorbed somewhere. 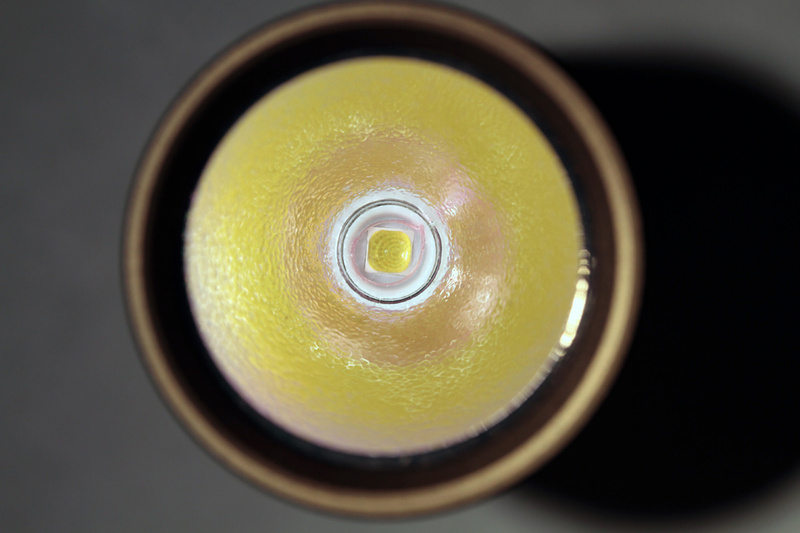 The effect would be cooking of the LED….not a great option either. I’ll be calling reflection of a photon that would otherwise hit the lens an ill one. Another option would be to go to the other extreme. Paint low, so low that we have no ill reflections at all. 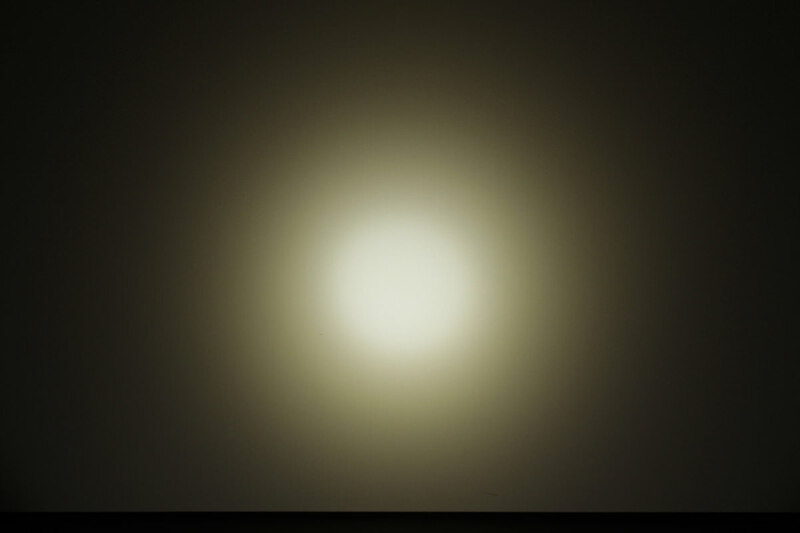 I see no ill effects with this approach and it should improve luminance. But by painting as low as needed to never capture good light means that we fail to capture a lot of stray light. Painting the collar marginally higher means that only light emitted from the corner of the die and only at barely-good-enough angle is ill-reflected. But we slightly increase the chance of having good reflection for the entire die. That drives us towards β=ε. Overall I believe that the optimum would be to choose some height that gives us δ<ε<β. I don’t know whether closer to δ or to β. Now how does is it related to slicing the LED? I believe they should be used together. But how? Slice as low as possible? In a LED that doesn’t have bond wires that would compromise collar effectiveness but maximize slicing effectiveness. Make the collar at the perfect height and slice right at that height? That would maximise collar effectiveness but increase risk that a photon reflecting off the silicone-air boundary fails to hit the die. How much can we gain? Note that IANAL but it seems to me that Wavien patent does not cover collars that are a part of the emitter. Interesting… Though it would depwnd on the accuracy of the dome itself. Also I’m not so sure having a solid dome would cause the light to reflect into the collar and back to the LED the way you’d expect as most TIR optics I’ve seen have air space between LED and optic. TIRs are always designed with airspace…but there’s no TIR involved with this kind of collar. Light is meant to reflect off the paint, not to TIR off the dome-paint interface. What exactly are the Wavien collar patents? The US 8 979 308 B2 that you list is not there. And doesn’t seem to be related to collars? That is why I am asking. Their page lists almost 70 patents, but not all of them. US8979308B2 is definitely about collars. This indeed looks like another collar patent. Dunno why when I searched it I got a different one, something about glass processing. Correct… but the emitter is not a small compared to the dome – in fact it’s roughly the same size as the dome, just a tad smaller. Because the bottom of the dome is flat – coplanar to the emitter – the light at each point on the surface will travel up first, then reflect off the so-called collar. But it may not necessarily reflect back onto the emitter. That is the reason for the air space in a TIR – to redirect the light as it hits the inner surface of the TIR. For this to work, you’d have to make the painted area a shape such that light hitting that painted area gets reflected toward the center of the LED that it can escape out of the unpainted area – would probably look like an axicon with a slight convex surface. I think with a dome, you will get more a TIR effect as you go along the edge, since the light will be hitting the edge of the dome at such a shallow angle. I think I understand what do you mean – a photon is emitted on the side of the die. Then hits the collar. Then is reflected. Since it was off edge, it hits the die off another edge. When it’s re-emitted off edge AND is reemitted towards the open part of silicone – the chances of it reflecting off the silicone-air boundary are high. If we managed to reflect it towards the centre of the die – it would have higher chances of escaping. Yes, I think that near edge parts of the die have dead emission angles – where light TIRs off the air-silicone surface. I think that flat (or dedomed) emitters have these areas larger. Yes, if we could redirect light towards the centre it would be better. Though it would also increase light loss at an earlier stage – light that bounces off collar but fails to hit the die. I think that the optimal shape that maximises chances that a photon bounced off a collar would be near spherical. I think that the optimal shape that maximises chances that a photon bounced off a collar eventually escapes the package is different. More light hits the collar from the closer end than from a farther therefore a flatter shape would probably be better. Much flatter? I don’t know but I have a hunch that it’s not. Anyway – we already have domes that are spherical or close to spherical. I believe their shape is imperfect but nevertheless good. I’m more worried about paints not sticking to the silicone or not surviving the heat…. Another idea would be to get a semi-hemispherical glass lens, coat the outer surface, and adhere it to an undomed emitter using a high-grade silicone. But here’s the rub with the dome on the emitter as it is. If you paint the reflective area very low, the reflection line perpendicular to the tangent of where the reflection line meets the dome has such a shallow angle in relation to the LED surface than reflected light would mostly go across… where it may hit the dome on the other side, hit or miss the emitting surface depending on its location. If you look at the de-doming work of ZozzV6, you see that after he trims the excess silicone (and therefore phosphor) from the sides, he essentially eliminates stray light going off to the side. So if you sliced the sides of the dome perpendicular to the edges of the emitting area, while leaving the rest of the dome intact, you should effect the result you describe without having to coat the silicone. I actually had thought of doing this, but the thought of potentially bricking an $18 XHP70.2 on DTP MCPCB has prevented me from trying. I may have some cheaper LEDs around to experiment with; have to look. Interesting idea with the glass dome. And it may actually increase light extraction – glass has lower refractive index than silicone so sum of reflections on silicone/glass and glass/air interface will be lower than silicone/air alone. However you add another silicone layer. If it has higher index than the one that covers the LED you may negate that improvement. Now that I think about it – it seems to me that high extraction coupled with collar would work better than low extraction of flat emitters. When it comes to light hitting very low….there’s so little of it that it’s not a big deal really. That’s why I think that a painted collar has a chance of being worthwhile when you can’t slice very low. Like SST-20. Or SST-40. The promise of a painting a collar on the LED dome is low cost and simplicity. Prepare a shim to make a slice. Paint the dome, wait for it to dry. Reminds me of some messing with silver that I did 5 years ago, but hurry up reading it because Flickr may ditch the pictures any time now. I wouldn’t call it a failure though I wouldn’t call it a success either. Thanks. I have backupped all my flickr images at home too, but for them to re-appear I would have to fix all the hyperlinks in all my old threads which will not happen. But I may fix some of them, perhaps the ones that are linked to in my “djozz tests” thread. But for the time being flickr did not remove the 2700 images of mine that are at threat, although they warned that from Feb6 on that could happen. Argo, please excuse this slightly off Topic post, but your title caught my attention and I figured perhaps it was something related enough to be of some interest. I experimented with this principle of corralling off-angle/side-angle light to a different situation – green tint-shift. pc_light, I’m amazed by how far off the topic you managed to stray….and at the same not. Yeah, I realize the only thing they have in common is “side emissions” and “collar” but you can imagine how your title caught my eye. This was something I debated about writing up/sharing because it seems so silly but you know us tint-snobs, we’ll go to great lenths and spend a lot of green just to avoid the green. Yes, I was just thinking out aloud. But there are optical adhesives that may also work as well as better match the refractive index of glass. As to paint versus ZozzV6’s “slice and dice” method… I think that when you do the “dice” cut, the sides have a TIR effect as well, redirecting light either to the top surface, or back into the emitter itself. Maybe even putting a reflective coating on those vertical surfaces would enhance the effect. I also thought of doing a ZozzV6 “slice and dice” and building up the outer perimeter with some kind of cement/epoxy mixture to make a giant version of a White Flat. Maybe not so useful, but it would protect and insulate the bond wires. Yes, if you’re chasing the last percent, painted sides should work. Actually it could allow you to avoid dicing at all. Just paint sides and you’ll eliminate side emissions. 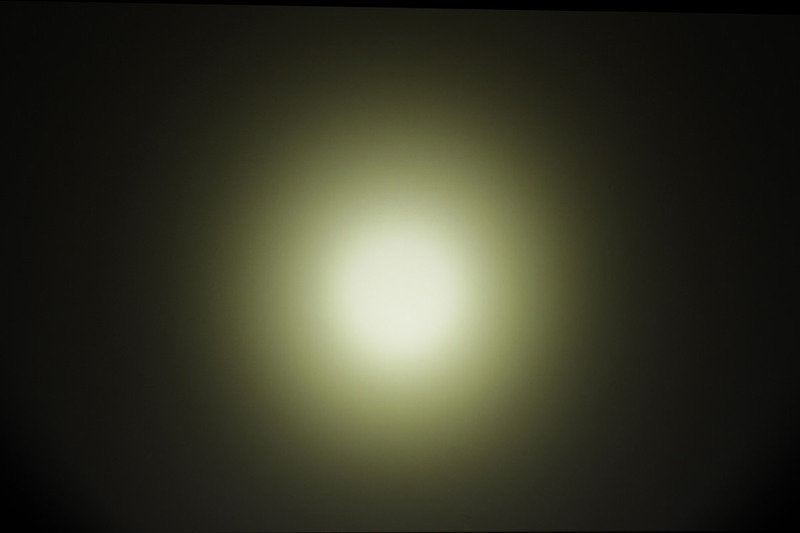 Maybe not the whole tint shift (because side phosphor may generate photons that go a bit upwards). Collar tint (and CRI) issues aside, couldn't we also attain increased intensity/output by hitting the die off-angle with one or more blue lasers focused onto it? Without collar, of course. Plenty of available blue laser emitters with the same frequency as the emitter's blue die, there would be no tint shift and no CRI crapping (I hope). A very nice idea! Would really like to see it implemented with XHP70.2. I wonder if painting the lower part of reflector would work? I don’t expect any of this will be very successful. I expect The larger the difference in collar and die size the greater the return of side emissions directly back onto the phospohors. A spherical reflector tries to reflect photons back onto the phospohors for recycling. The smaller the reflector the greater the change in incident angle across the die. Same reason a big lense is better then a small one. The smaller the dome the more likely the light hits off angle and ends up either getting lost due to being absorbed in the dome material, heading out the opening at an odd angle, or not hitting the phosphors at all. It should but I was reluctant to mess with reflector in any way (I know better), the emitter on the other hand will withstand more handling. Plus when I first did this, I figured if it was a disaster, I could simply de-dome. With a reflector I’d have no way of removing the tint without handling which would leave marks. Collar tint (and CRI) issues aside, couldn’t we also attain increased intensity/output by hitting the die off-angle with one or more blue lasers focused onto it? Without collar, of course. Plenty of available blue laser emitters with the same frequency as the emitter’s blue die, there would be no tint shift and no CRI crapping (I hope). I posted a questing about the same thing. I too am very interested to see if the leds themselves can be laser pumped. That said, if it was only the blue light from the led being bounced back and reexciting the phospohors then we wouldn’t see a doubling of intensity with a RLT collar, there just isn’t as much blue phospohors in the already converted white light. I’m starting to believe the best way to think of the led surface as a mirror. If you can return all the stray light you get a much higher chance of it reflecting in the right direction. A laser just tries to get more light from the led, that doesn’t happen. If you can return the lost light it can have a chance of going the right direction the next time, it may take hundreds of tries, but it will eventually. Laser pumping still loses the stray light and doesn’t make the led make “more” light. You may get “reflections” of your laser, so you added that power, but it too goes random directions. I expect the phosphors are like inductors, they can become saturated and not release more light, but maybe they can “reflect” the light coming back on them. Once concern I have is how reflective is the paint going to be that you put on the dome. What color paint would you use? White? Silver? Mirror spray paint? If you use white, the paint will reflect light in all directions… not just back to the source. If you try silver mirror spray paint… that stuff produces a mirror surface on glass, but isn’t designed for spraying on silicone. Not sure what result you’ll get. And in any event, I doubt these paints are designed for high heat. Is your paint going to cook and catch on fire? Someone should try it and find out. Engine block paint would work fine, heat wise. They may even have a metallic paint. I don’t think a metallic paint would be any better than just using white paint. In both cases the light will scatter everywhere and a darker metallic color will probably absorb more than white. What you really want is a mirror finish on the inside surface where the paint sits on the dome so that light coming out of the dome is reflected directly back to the emitter and nowhere else. There is some special spray paint available that creates a mirror-like reflective surface when sprayed onto glass. Not so sure it would on Silicone and I doubt it could take the heat. Howbow that new Nichia with the glass dome? Well, there probably wouldn’t even be a need to paint, since even without the paint there is light reflecting off the surface of the dome from the TIR effect. 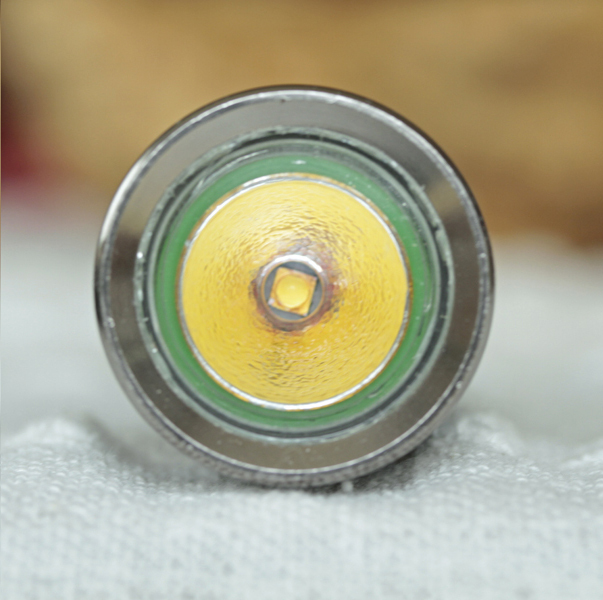 But even if we could apply a reflective coating, I’m not sure how much reflected light would get back on the die. First, because the LES is not a small point in relation to the dome, the light may or may not reflect back to where it can leave the dome. Second, the perimeter of the LES is transcribed on a circle (the base of the dome) which accounts for at least a 57% larger surface area than the LES. So if the coating and silicone were 100% efficient and the light is randomly scattered, it would have a 64% chance of hitting the LES. On some emitters that area is coated with phosphor, but that area would be under paint. 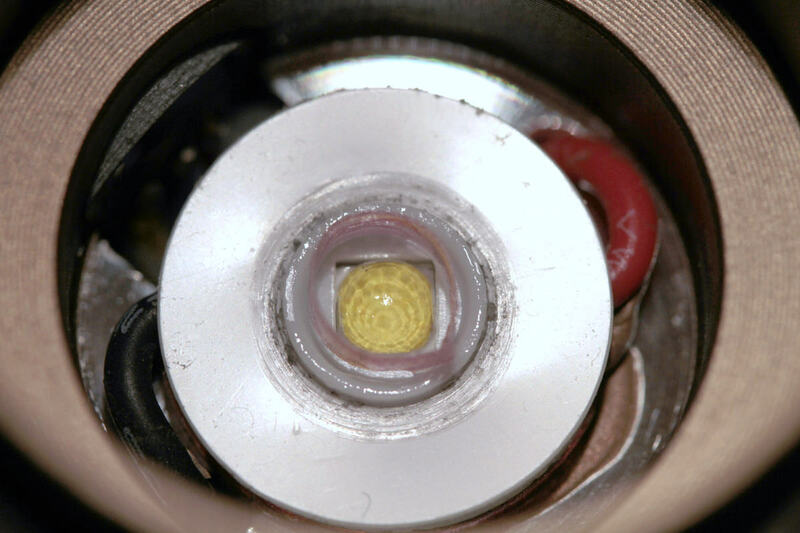 So selection of LED would be important – maybe a Nichia with its hexagonal LES may be a good candidate. Third, since the LES is at least as large if not larger than the unpainted aperture, the light may or may not leave that aperture with a defined angle the way it does with an RLT. But I could be wrong, and this would be fairly easy and inexpensive to test. Djozz has seen 20% improvement with a silver mirror which he claims to be better than mirror paint which in turn would be much better than white paint. I trust that djozz is right so I think that his result is an upper bound for what can be gained. Or close to an upper bound. That’s not exactly apples-to-apples because he didn’t dedome. I’m not sure if the expected improvement would be higher with or without dedoming. Yes, I share the concern that a mirror paint wouldn’t work for some reason. But performane of white one would be way worse. F.e. with SST-20 die area is 2 mm² while under-the-dome area is 6.9 mm². Furthermore some light reflected off white collar would escape up through silicone – at wrong angle. So I see only marginal potential for improvement unless we can make a mirror. ADDED: another small loss on a white dome: light reflected towards another part od the dome would risk being absorbed again.